L to R: SC FFA State Officer Logan Layne, Thurmond FFA Advisor Darla Steele, Colton Kirkland, Logan Pollock, Kevin Smith, Allie Jhant and SC FFA State Officer Curt Berry. 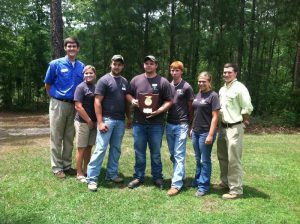 The Strom Thurmond Career Center FFA Forestry Team took first place honors in the state finals held at the Harbison State Forest near Columbia, SC, on Saturday, May 5th, 2012. Team members Allie Jhant, Colton Kirkland, Logan Pollack and Kevin Smith along with Darla Steele, Agricultural Education instructor and FFA advisor at the Center, were awarded expense paid trips by the SC FFA Foundation to attend the National FFA Convention in Louisville, KY later this year where they will compete in the National FFA Forestry Finals. Colton Kirkland was also named the 2nd high individual scorer in the state event. Clay Timmons also competed in the event as an alternate and will return next school year to compete for the state event. The hands-on natural resource educational event was planned and conducted by professionals of the State Commission of Forestry with assistance from Clemson University Agricultural Educational staff. The Forestry CDE is a competitive activity that allows students to apply classroom knowledge to real-life situations. The contest consisted of: Compass & Pacing, Tree Measurements, Tool & Equipment ID, Insect and Disorders ID, written test & Timber Stand Improvement. Good Luck to the Team as they compete in the National Contest this fall!